Vampire Beauties: Vampiress Review: "The Breed"
The Gist: A human federal agent enters a world of supernatural crime as he's informed that vampires are real and is given a vampire partner to help solve crimes that are believed to be committed by vampires. Clarification: Basically a crime drama. Vampires have outed themselves to human authorities and are living as a sub race among them. Problem is there is a group of vampires who don't like the idea of living among humans and they have concocted a plan with the goal of eventually eliminating humans altogether. Meanwhile a cop named Steven Grant must wrap his head around the fact that not only are vampires real but separating the negative stigma of them being a threat from the reality that some of them are good people. 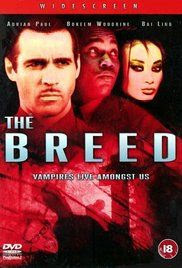 Basically this is a film about race relations with vampires playing the part of minorities. Female Vampire Factor: While there are some background vamps in the film there is only one female vamp main character and that is Lucy Westenra (Bai Ling). This isn't much of a vampire movie as much as it is a crime drama featuring vampires. The one positive is that her fangs are always out. Lucy starts out as a suspect in the case but ends up becoming more of a middle man informant who helps the detectives get to the right people they need talk to. Eventually her and Steven get very close to the point that his feelings for her helps him warm up to the idea of vampires as a group not being a threat. I give the film a Vampire Beauty Rating of 2 out of 5. The movie is great and very entertaining on it's own just don't go into it looking for a horror film or any neck biting whatsoever.